After uranium is mined and milled, the tailings—the crushed-up rock which formerly contained uranium—is typically disposed of at the mining and milling site. In the United States, the Nuclear Regulatory Commission (NRC), the federal agency regulating all aspects of the nuclear fuel cycle except uranium mining, regulates all aspects of tailings management and disposal. The various aspects include the following: siting and design of tailings impoundments, disposal of tailings or wastes, decommissioning of land and structures, groundwater protection standards, testing of the radon emission rate from the impoundment cover, monitoring programs, airborne effluent and offsite exposure limits, inspection of retention systems, financial surety requirements for decommissioning, and long-term surveillance and control of the tailings impoundment. The NRC specifies the general design requirements for long-term tailings-storage facilities, and the NRC’s regulations are written so as to take account of the particularities of each mining and milling site. The design configuration preferred by the NRC is as follows: “The ‘prime option’ for disposal of tailings is placement below grade, either in mines or specially excavated pits (that is, where the need for any specially constructed retention structure is eliminated). The evaluation of alternative sites and disposal methods performed by mill operators in support of their proposed tailings disposal program (provided in applicants’ environmental reports) must reflect serious consideration of this disposal mode…[In exceptional] cases, it must be demonstrated that an above grade disposal program will provide reasonably equivalent isolation of the tailings from natural erosional forces.” Tailings facilities must be engineered to be effective for 1,000 years. All facilities must also include a multi-layer water-balance cap designed to limit infiltration and control runoff of precipitation, liners to prevent releases into groundwater, and monitoring systems to detect changes from background conditions. 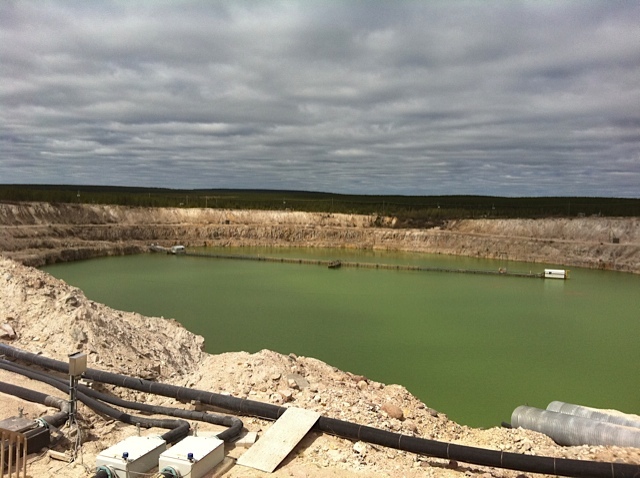 The NRC protection standard also requires prospective licensees (companies proposing to mine uranium and dispose of tailings) to demonstrate that tailings storage facilities are capable of withstanding severe weather and seismic events. Facilities must be located above the Probable Maximum Flood plain and designed to withstand hurricanes, earthquakes, and floods. Water levels in the tailing cells must be monitored continuously, and any abrupt change in water level due to a containment breach must trigger an alarm to activate the appropriate response by operations staff. After closure, a cover system designed to withstand erosional forces produced by any severe weather events must protect the tailings; tailings cells must be located above plains where flooding is at all likely to occur. After fulfilling the reclamation requirements contained in the NRC regulations and obtaining the NRC’s approval for its reclamation job, a mining company transfers ownership of the tailings disposal cells to the U.S. Department of Energy (DOE). Thereafter, the DOE sees to the long-term care and maintenance of the tailings facilities. Tailings impoundment at JEB mill in northern Saskatchewan. Tailings go into the former open pit and are kept under several feet of water. Take note of these important characteristics of the design, characteristics which the U.S. Nuclear Regulatory Commission would require for a tailings impoundment in the U.S.: 1) keeping the tailings wet as a heavy liquid slurry and keeping them under water as they are stored eliminates the dispersion of any dust from the tailings 2) keeping water over the tailings traps radon gas, which cannot be released from the tailings into the environment 3) Even in the event of a hurricane or flood, this facility would keep the tailings isolated from groundwater. The facility can accommodate several feet of excess water, far more water than it would receive in a “Probable Maximum Flood” event—or the greatest precipitation event at all likely to occur where the facility is located.